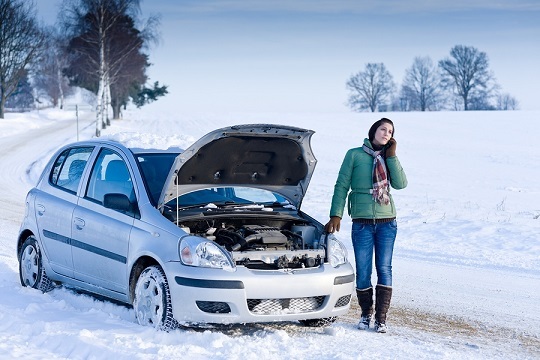 The cold and frosty weather that comes with winter can turn your trustworthy car into a mechanical nightmare. Here is a list of hints and tips to avoid your car going in to see a mechanic. Frozen screen wash – Although it is not really a breakdown as such. If your screen wash is frozen do not keep running the pump to clean your windows. Doing so can cause the burn the pump out and can blow fuses affecting something like the immobiliser system. Use screen wash all year round but during the winter use undiluted screen wash. This will prevent the fluid freezing. Frozen wipers – Once again not really a break down but if the wipers are frozen to the windscreen and you operate them then this can once again blow fuses to vital electronics in the car. If the weather is down to be frosty and cold make sure you turn off the automatic windscreen wipers so they don’t try to operate when you turn the ignition on. And make sure the wipers are unstuck before setting off too. Frozen engines – Engines can freeze due to a lack of anti-freeze. Make sure you have it checked regularly and get it topped up with the correct type of anti-freeze for your engine. Stripped teeth on cambelt causing engine damage – If your water pump is frozen and you turn the engine on, you could strip the teeth off the timing belt leading to expensive internal engine damage. Frozen door locks and seals – Operating a frozen lock can damage the locks potentially making it impossible to lock your car. Opening a vehicle’s door which has frozen can damage the seal and cause leaks. Simply prevented with a squirt of WD40 in the locks and Vaseline or silicone polish around the door seals. If snow falls, clear it when it’s fresh don’t let it freeze over this will turn your car into an ice cube. If, god forbid, your vehicle has to go into the garage then we at Easirent Car and Van Hire in Blackburn are here to help and make the situation as easy as possible. We have an extensive range of cars available to hire starting from a Fiat 500 and going up to a Volvo V60. If you are wanting something that can handle the icy weather of winter, then at Easirent Car and Van Hire in Blackburn we also have a Toyota Hilux and a Land Rover Defender, both have four wheel drive so can tackle the icy roads with ease. So book your vehicle today. Call Joe or Mark on 01254 495999 or visit our website at https://www.easirent.com/.